My mother used to tell me about the day that FDR died. She said that the whole sky went black, just like it does on a summer's day before a storm. But this was early April, though it had been unusually balmy for the last week or so. It was late afternoon before she recalled hearing the news on radio that the President had died earlier. As preparations were being made for his funeral in Washington, DC and, his later internment at his home in Hyde Park, NY, a drama was being played out that would remain largely unwritten about for several decades. The President had been at his usual retreat in Warm Springs, Georgia when he was fatally stricken with a heart attack. This was not unexpected, as he had been in poor health for many years. Along with his paralysis, his blood pressure at the BEGINNING of the War was 250/140. There were no drugs available for the doctors to counter this pressure, which surely built up over 3 full terms as President. He was literally a ticking time bomb. Where the drama begins is the fact that The President's long time lady friend, Lucy Mercer Rutherford, was with him at the time he passed. And the drama continues as the First Lady seeks to uncover the truth about who was with her husband at the time of his death. With her detective skills in sharp order due to having served as her husband’s legs and ears on several cross country trips, she soon cracks the mystery. But the story continues on from there. The President had a specially designed train for protection. The Presidential Pullman Car was named "The Ferdinand Magellan" and Roosevelt made regular trips on it; mostly to his home in Hyde Park, and sometimes out West. The car was 142 tons in weight. There was no precaution too great to take in protecting the President. These things are all well known. What is less known are the special trips he made to side spurs along the way. There the President would remain for almost 12 hours at a time dallying with Ms. Rutherford. This was all about to become known to Mrs. Roosevelt as the train crossed the country, first from Washington to Warm Springs, then back to Washington for the State Funeral. 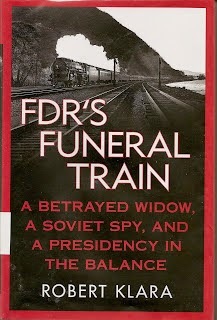 From there the train would be loaded up again for the final journey to bury the President at Hyde Park, NY. The trip was filled with even more high drama as the newly sworn President Truman tries to figure out the secret everyone is trying to keep from him. He needed to be told about the A-bomb but no-one wanted to be the one to breach security and tell him first. At the same time there is a suspected Soviet Agent on board, trying to find out what everyone else is whispering about. That all this occurs as the nation mourns the loss of the President while the country is still at war really ups the stakes. Well researched by the author, Robert Klara has given us a slice of history that has been denied us until now. Using recently released documents and old diaries and letters, he has pieced together a story that would be the envy of any author of fiction. That it is real makes it all the better. It is also reminiscent of an Agatha Christie novel, from the setting on the train to the wild cast of characters, who are, in this case real.